In fitness as in every other industry, people prefer providers that identify their preferences with as a result of that there is a vast number of training and nutrition philosophies, each of them associated with its own style and even a culture. The preferred gyms, brands, restaurants, equipment etc. vary for powerlifters, crossfiters, bodybuilders, weightlifters, gymnasts and so on. That’s why it is vital to show how you are different, but how to do that online without having any development knowledge? 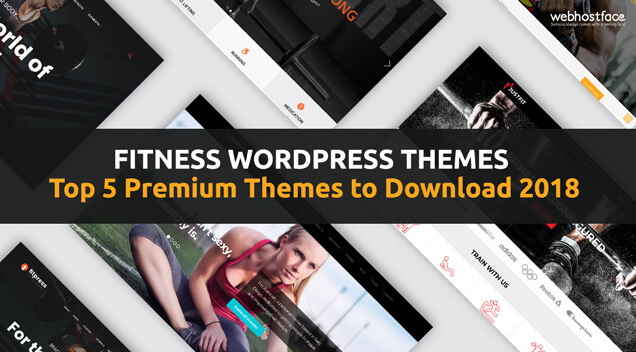 We created a list of top 5 Fitness WordPress Themes built for fitness related projects that will help you reach out to your customers and express your way of achieving goals. The first theme on our list includes fluid responsiveness to assure that your website will automatically adjust and optimize itself for the best display on all devices, browsers and screen sizes. The theme comes with unlimited colours and backgrounds to find the style which matches your website’s personality. 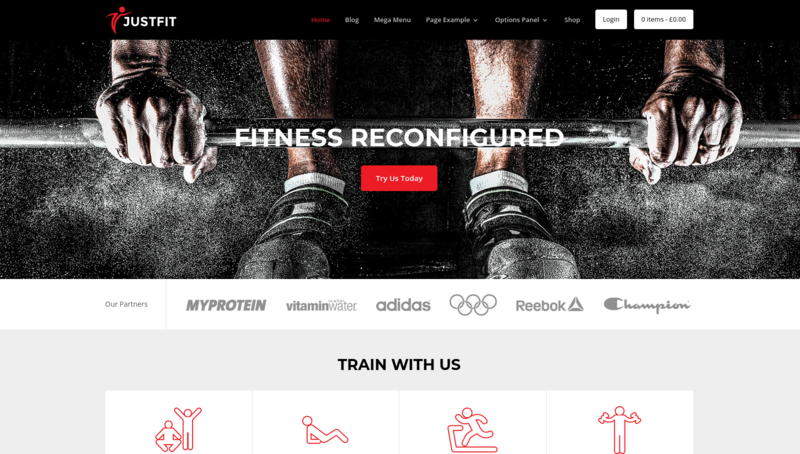 JustFit Fitness WordPress Theme is a very good choice for sellers of supplements and gym equipment as WooCommerce is integrated with the theme and social media buttons are pre-built. Each business realizes the importance of social media in regards to gaining popularity and traffic to the main website. Another great advantage of the theme is the video post section since in the fitness industry advertising depends almost entirely on visual content. GymEdge offers a total of 10 mobile friendly Home Pages with great design, 4 different header styles and 21 custom add-ons. The theme comes with different class schedule layouts, Body Max Index calculator, layouts added for class, trainer, testimonial and blog. 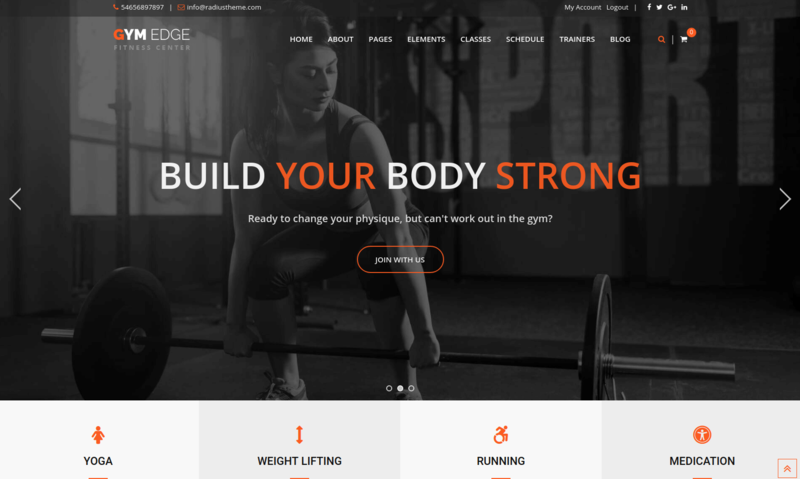 GymEdge Fitness WordPress Theme is using premium plugins like Visual Composer, Layer Slider and Contact Form 7. The theme is compatible with WordPress version from 4.5 to the latest one and with WooCommerce from version 2.3.x to the latest one. User-friendly drag and drop design elements will help you to create complex pages in no time. One of the biggest advantages of In Shape is that it is translation ready, the theme developers have done extensive testing and made it compatible with WPML. Using this plugin lets you translate everything: pages, posts, menus, taxonomies, etc. The theme comes with a contact form module, so your customers could contact you right away. With In Shape Fitness WordPress Theme, you can set a backup schedule and have backups created automatically. Choose from a large set of layout options and experiment with your pages structures, save your favourite layouts in the built-in library, and use them whenever you need to create a new page. With the content modules provided by FitPress, you can add buttons, images, sliders, contact forms and more to your website. Create online schedules for a single or multiple events and customize the appearance of each with the Timetable plugin. 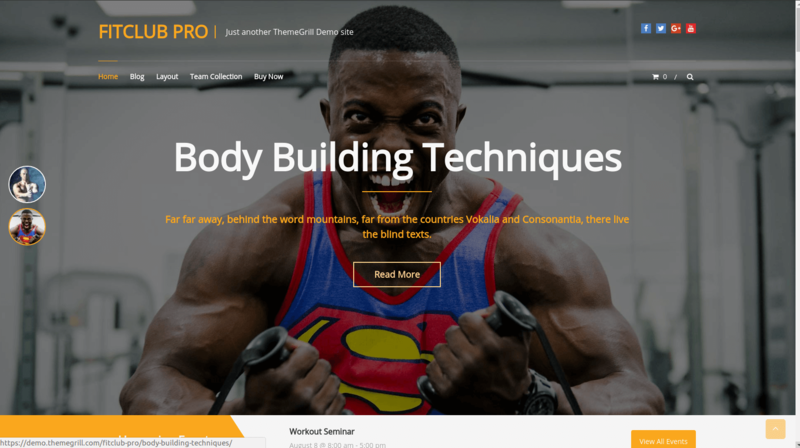 Take advantage of the custom widgets that enrich FitPress Fitness WordPress Theme with advanced functionality. 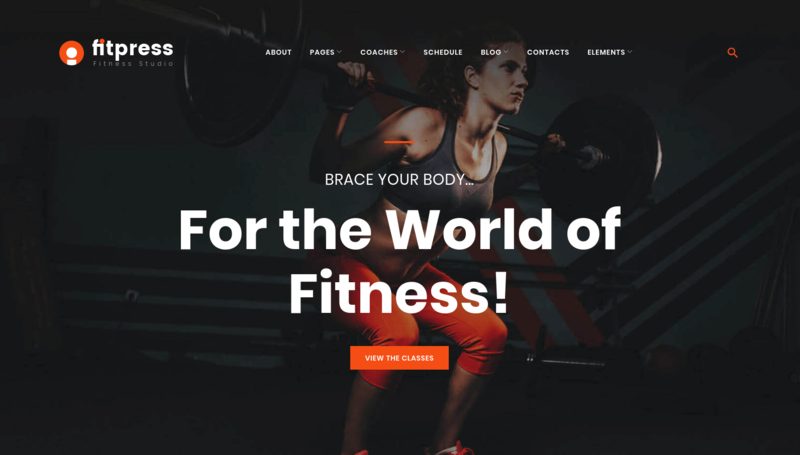 FitClub is one of the most popular Fitness Gym styled WordPress themes at wordpress.org & the numbers of websites it’s empowering is constantly increasing. The combination of the theme’s features such as 4 default layouts, 3 custom menu locations, 13+ widgets and much more will help you create a unique website in no time. The primary colour option, site logo and footer copyright editor will change the theme’s character according to your brand. The 5 themes on our list will certainly help any professional involved in the fitness industry such as personal trainers, gym owners or fitness products manufacturers to stand out among competition online while keeping a focus on their primary engagement. You can benefit from a fast and reliable SSD WordPress Hosting with our shared hosting services. Now with a greatly discounted price! Start your new WordPress project without investing a large amount of money and grow your online presence! And we can help you start and grow your site!